Shimadzu´s new simultaneous ICPE-9000 can be used in application stages for a wide range of high-precision analytical assessments from high-level R&D to environmental management analysis to high-concentration component analysis. 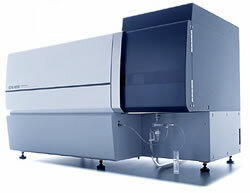 The ICPE-9000 utilizes a large-scale CCD detector, an Echelle spectrometer, as well as an extremely stable vacuum spectrometer, which enables stable performance over extended periods. The ICPE-9000´s innovative Mini Torch minimizes cost by reducing consumption of argon gas to half that of conventional torches. The ICPE-9000 features easy-to-use, innovative ICPEsolution Software, which offers such features as a Method Development Assistant, a Diagnosis Assistant, and more. Utilizing a large-scale 1-inch, 1 megapixel CCD detector, together with an Echelle spectrometer, provides high-speed measurement while retaining precise resolution. For details please refer to installation requirement manual.